Anyway, keep looking at the flowers Peeps, because even though we still have snow, and the wind feels like a summer breeze from Siberia, Spring MUST be coming soon, right? I "Borrowed" some swizzle sticks from a well known coffee shop recently to use as spatulars for my flitter glue!! Is that allowed? I love your flowers and yes, spring has to come soon now 'cause I caught a nasty cold in that summer breeze from Siberia (it was disguised with a little sunshine over here). As you borrowed 30 sticks, what will you do with the other ones ? Or did you make a lot of flowers and planted them in the garden? Love your beautiful basket of flowers Faye ! Spring might be here this weekend. Upper 50's and 2days off! Yea!!! this is so sweet..love those flowers. 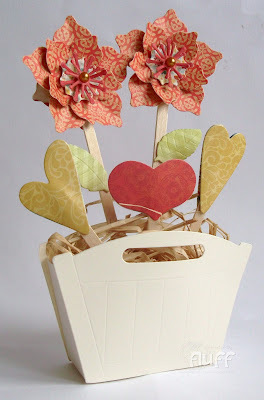 Love your blooming basket, Faye. Absolutely stunning. Gorgeous flowers Faye. I love the pretty papers you've used. Great project Faye and love the flowers. Glad little one enjoyed his breakfast . I use them for adding perfect pearls as they are just the right size for fitting into the mister bottles. A HUNDRED AND ONE USES FOR THEM!!! !AND THEY MAKE A LOVELY CUPPA IN THE BARGAIN!!!! This is sooo pretty Faye! Lovely! LO-VE-LY! 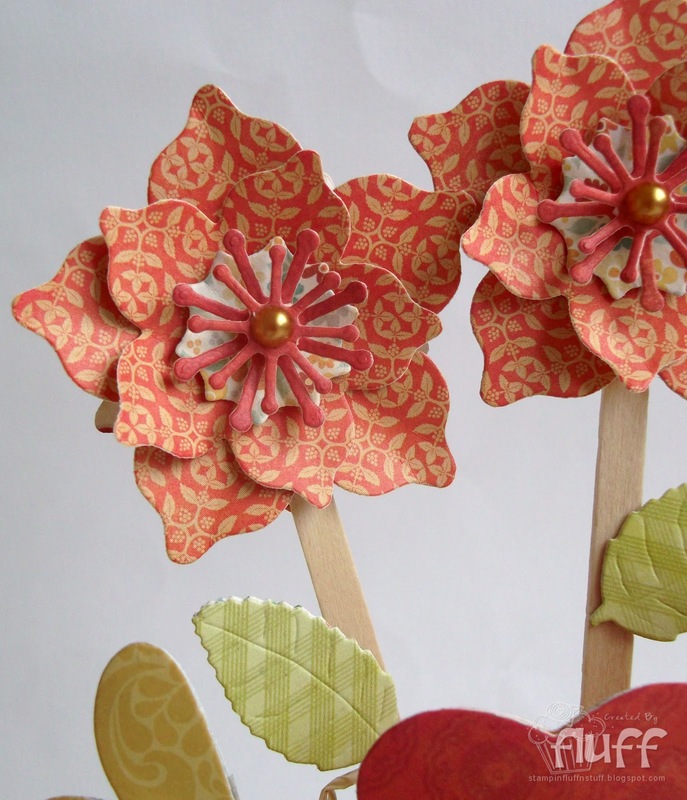 Those layered flowers are beautiful! Have a fab weekend. Now I am loving this idea and may have to go and pop to that place for breakfast too in order to get the supplies.